All images courtesy Masonry Technology Inc. The construction industry has witnessed an ongoing trend toward large-dimension material panels over the last 60 to 70 years. 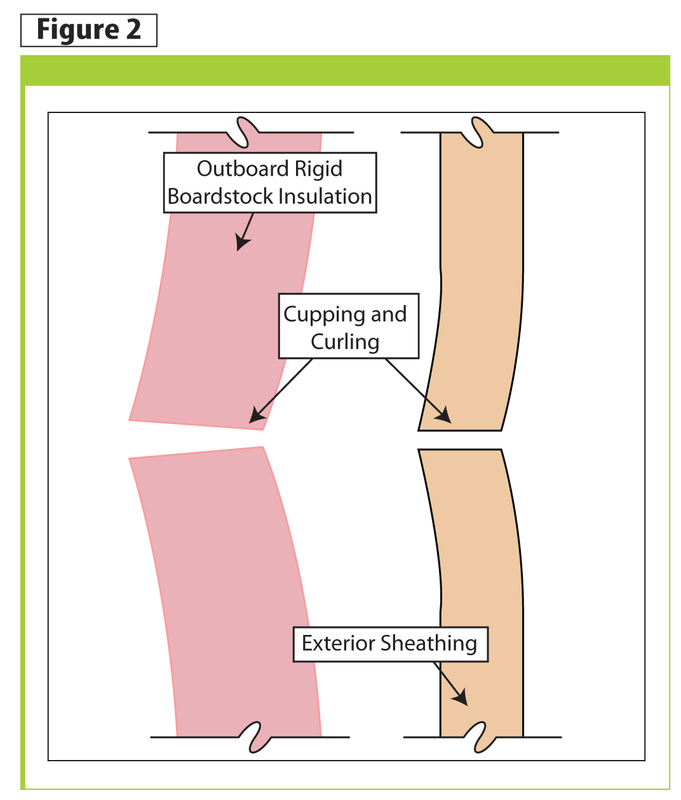 A pattern of 1.2 x 2.4-m (4 x 8-ft) sheets of oriented strandboard (OSB) and plywood have replaced 0.3 x 3- or 0.3 x 3.6-m (1 x 10- or 1 x 12-ft) shiplap board stock as the sheathing material of choice for the exterior building envelope. The factors driving this trend include labour savings, better material use, and the positive structural characteristics of these larger panels. Sheet stock construction material sizing has also increased, and for the same reasons. Specifying 2.7 to 3-m (9 to 10-ft) wide rolls of synthetic water-resistive barriers (WRBs) in place of 1016 to 1371-mm (40 to 54-in.) rolls of asphalt impregnated roll stock is increasingly common. All the exterior building envelope components are connected and have an effect on one another. While the impact may be slight, it is still a factor. 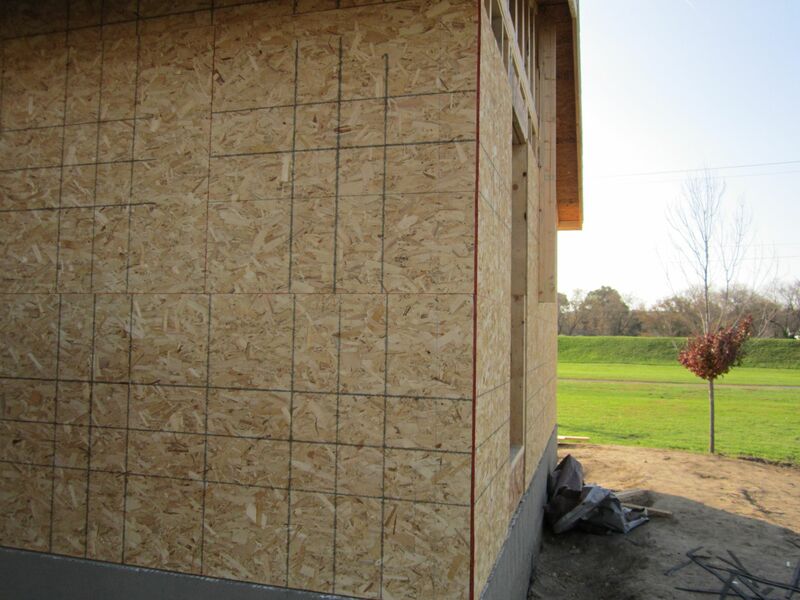 In the case of material panels, the expansion-contraction characteristics of a 1.2 x 2.4-m sheet of plywood or OSB must be considered and the appropriate detail needs to be designed. 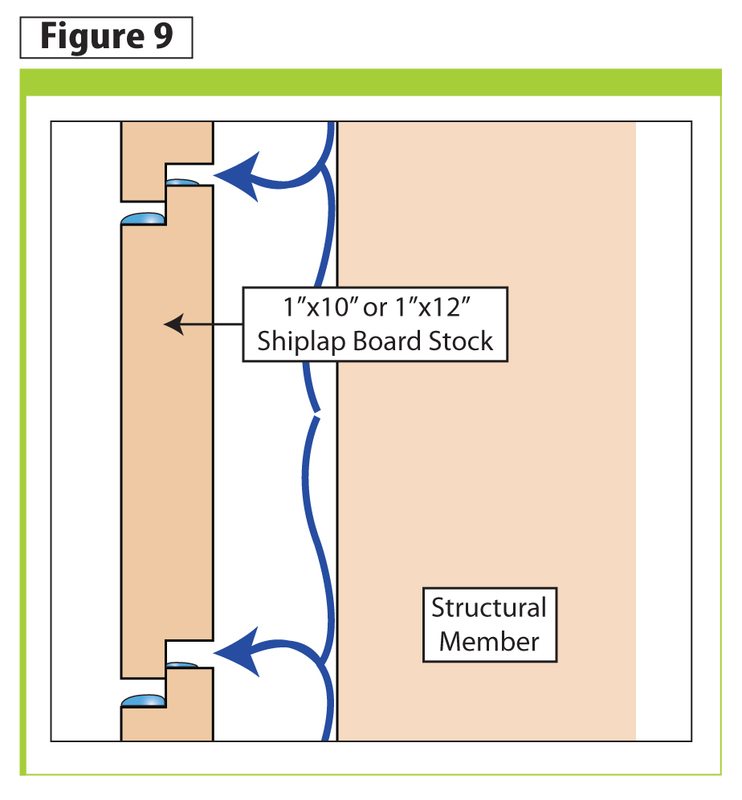 The reason this new detail design is required is not because plywood or OSB expands or contracts that much more or less than shiplap board stock; rather, it is because the expansion-contraction of the 1.2 x 2.4-m sheet panels—3-m2 (32-sf) area—is directed and occurs at the edges (i.e. joints) of the 1.2 x 2.4-m panels (Figure 1). 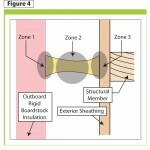 The same area of wall, roof, or floor decking covered with the shiplap board stock may expand or contract a similar amount, but this expansion and contraction will not all accumulate and occur at the outside edge of the 3-m2 area. 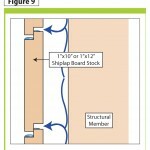 Instead, it will be dispersed within this area between each 0.3 x 3 or 0.3- x 3.6-m shiplap board stock. This dispersion minimizes the movement and, therefore, the stress at the joints. This movement, and the stress it creates, impacts the other components of the exterior building envelope including the fastening mechanisms, structural members, covering membranes, and coatings. 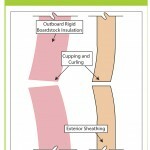 There is another phenomenon that happens at the perimeter of the construction material panels; they curl up or down. When these panels of material experience a variance in moisture content and temperature (i.e. wet/dry, warm/cool), they expand and contract. 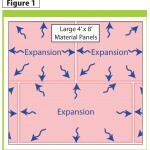 This expansion and contraction creates stress patterns in the field of the panels. When the stress occurs in the centre of the panels, there is adjoining material with similar stress patterns that oppose and neutralize the stress in the centre. However, the perimeter does not have this oppositional stress on all sides, allowing the edges to distort and curl up or down (Figure 2). The edges of these construction material panels are also exposed to moisture penetration. 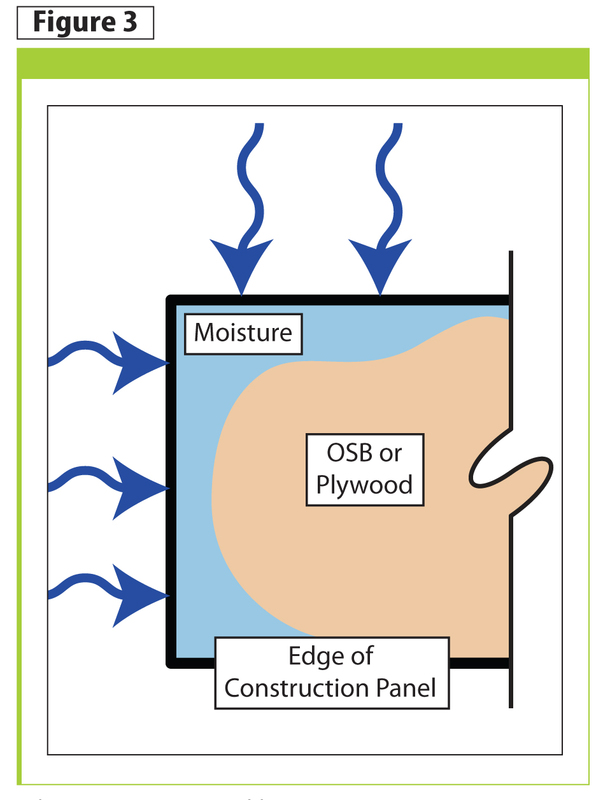 Even when there is no additional moisture at the panel’s perimeter, there is more surface for moisture to penetrate (Figure 3). The surfaces of these edges may be more open to moisture because of saw cuts, exposure during shipping, and poor storage methods at the jobsite. Fastening mechanisms are required to hold materials in place. They are also required to do so following a certain fastening pattern, and that fastening pattern needs to be correctly engineered. Most fastening mechanism failures follow a zipper-like pattern. Stress is incorrectly compensated for, and one or more fastening mechanisms stress to failure causing the released stress to transfer to the adjoining fastening mechanisms that in turn are overstressed to failure. This ultimately leads to overall system failure. 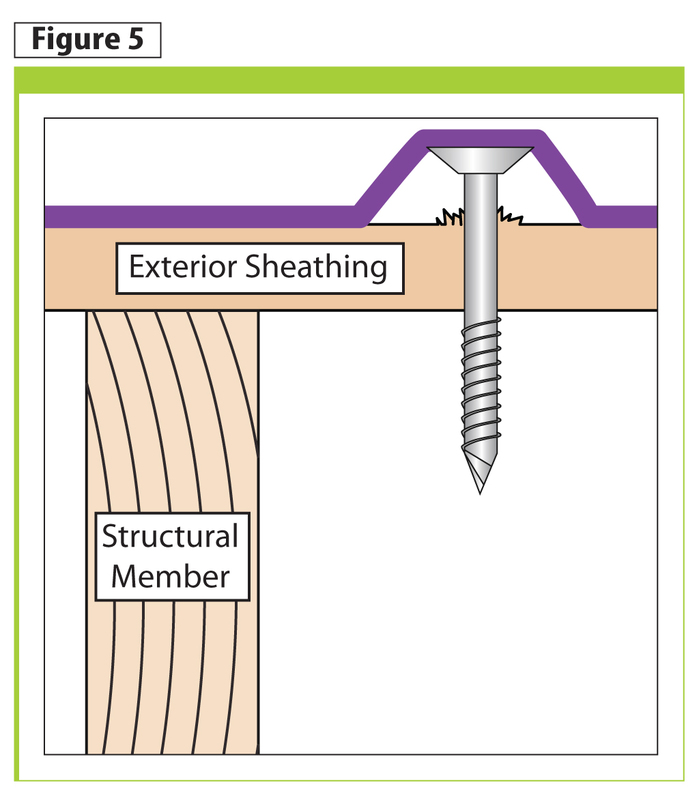 Fasteners are also affected by poor or improper installation techniques, including adhesives that do not bond with contaminated surfaces and carelessly installed mechanical fasteners that miss the structural members. If mechanical fasteners (i.e. 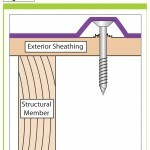 screws, nails, staples) are not seated into structural members, they tend to float and back out. 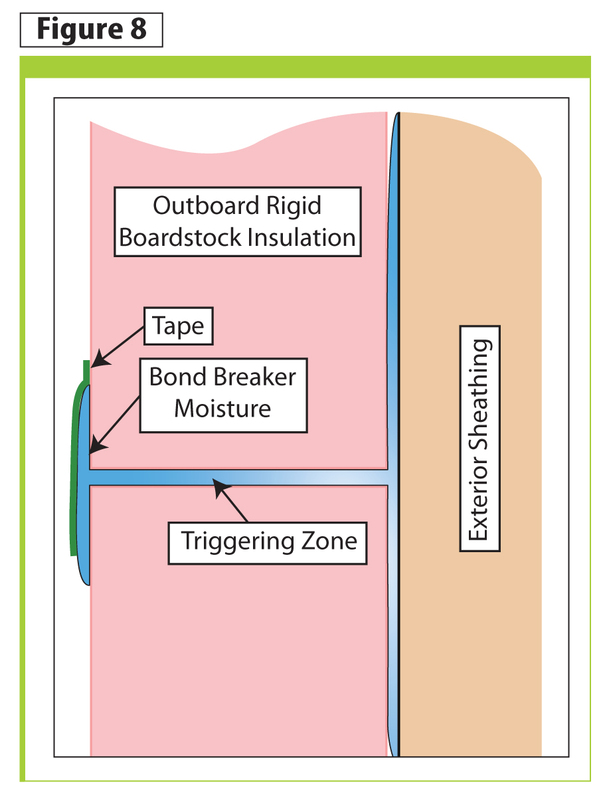 This can cause point-pressure stress that may damage other components of the exterior building envelope such as moisture-resistant materials and/or waterproof coatings (Figure 5). They also create unnecessary penetrations through the WRBs and act as thermal conductors through the sheeting and into stud, rafter, and joist cavities. 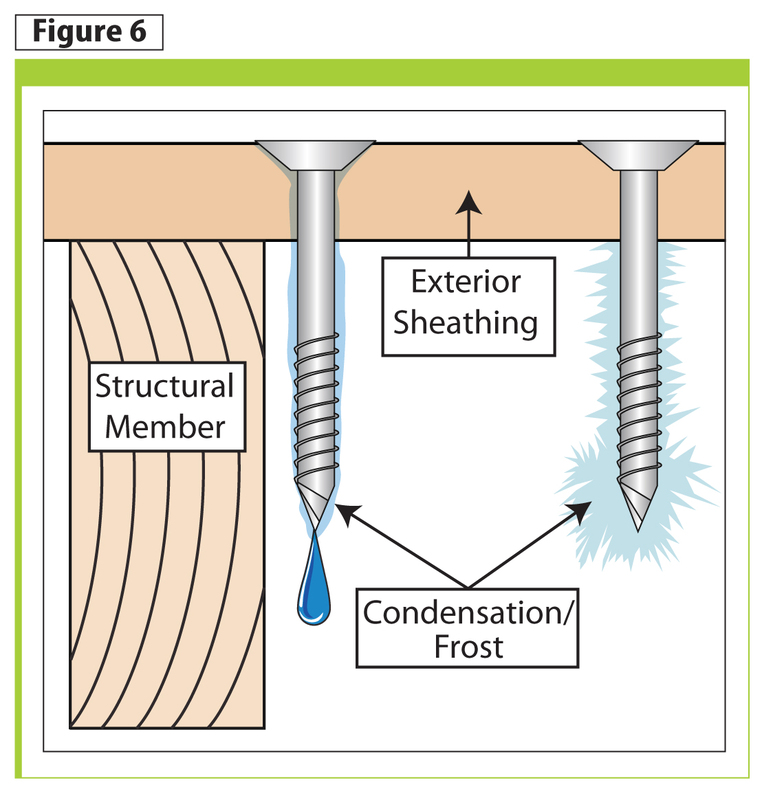 If these exposed fastener shafts or heads convey a dewpoint temperature, they may accumulate condensed moisture in the form of water droplets or frost (Figure 6). Large panels of construction materials also influence the exterior building envelope’s performance by directing air pressure equalization requirements to their perimeters. This is generally true with all materials of any dimension, small or large, but similar to the expansion-contraction movement of larger panels of material, it is directed and accumulates at the edges. As with the expansion-contraction movement, there are not necessarily more or fewer pressure equalization requirements—the significance is they all occur at the perimeters of the larger area. This concentration in a smaller, more restricted area causes a unique phenomenon. The negative results of a contaminant—in this case, moisture—are directly connected to its physical form and amount of concentration in a material or location. An example would be a litre of water in vapour form dispersed throughout a house as opposed to a litre of water in liquid form concentrated in a single window sill detail. This phenomenon starts to occur immediately on placement of a large construction panel. The surfaces covered by these panels will have some degree of moisture concentration. 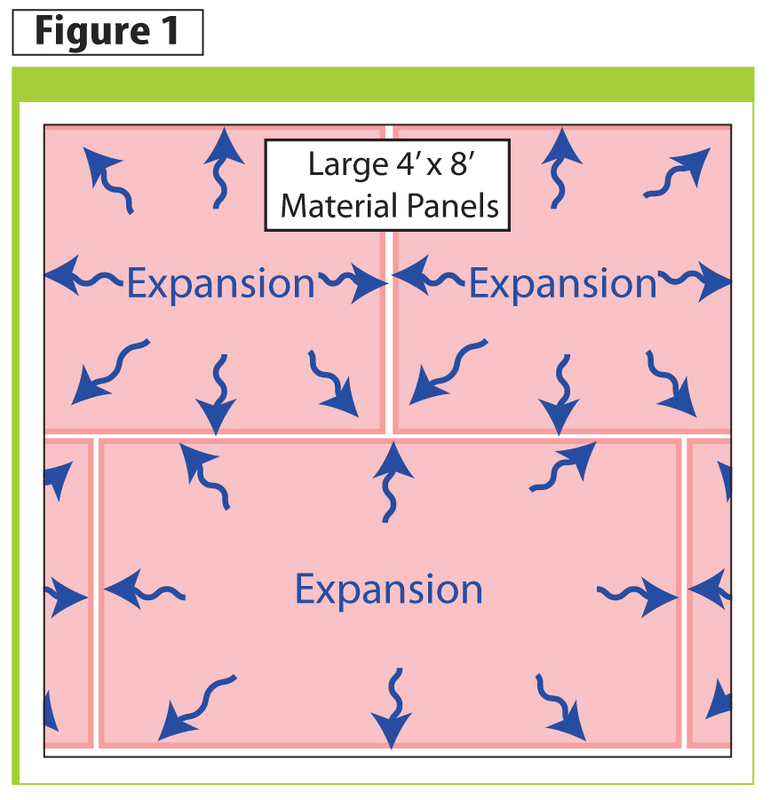 Once placed, a large construction panel begins restricting free air movement over a large area, and impacts the pressure of the volume of area. If the encompassed area holds high pressure, the high pressure will attempt to equalize with a lower pressure. If this lower pressure is located outside the perimeter of this construction panel, air from the high pressure area will move to the low-pressure area and will take some moisture with it. 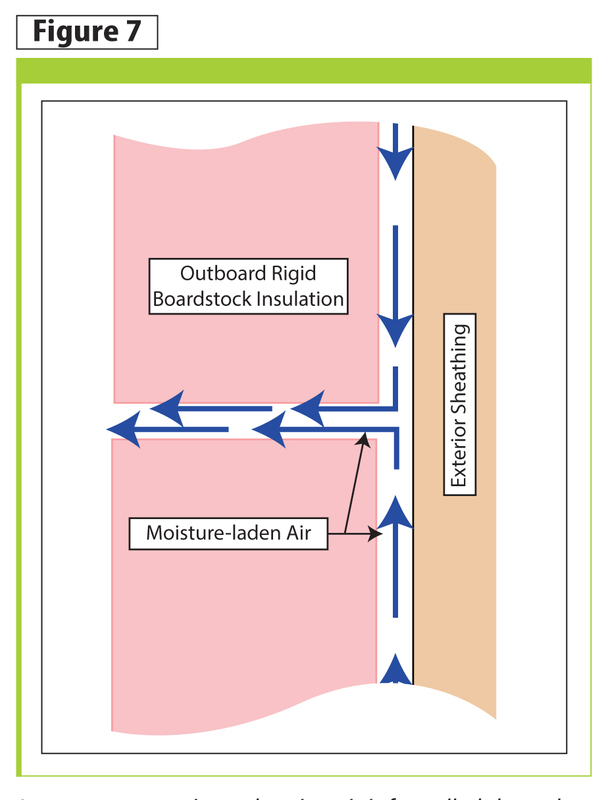 This pressurized air, moving to a lower pressure and carrying moisture with it, is funnelled through the perimeter edge joints of the large construction panels (Figure 7). 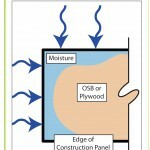 When certain conditions prevail—such as dewpoints caused by the temperature of the ambient air or temperatures on the surfaces of material that the moisture-laden air moves past—water vapour may condense on and accumulate in the panel joints and on the surface adjacent to these joints. This liquid water will wet the surfaces in these joints and absorb into their edges and materials adjacent to the edges of the construction panels. In turn, this wetted material will conduct temperature more readily than dry material, amplifying the negative condition. The failure of tape at the taped joints of large construction material panels may be attributed to this phenomenon. 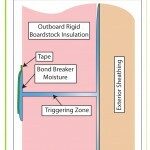 The joints are contaminated with moisture (a good bond-breaker) before the tape is applied, and the tape’s ability to bond is degraded from the inside out (Figure 8). This condition is exacerbated when the taped seams (i.e. 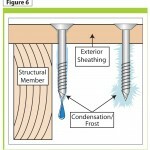 joints) fail, and moisture is allowed into and behind the large construction panels from the outside in. 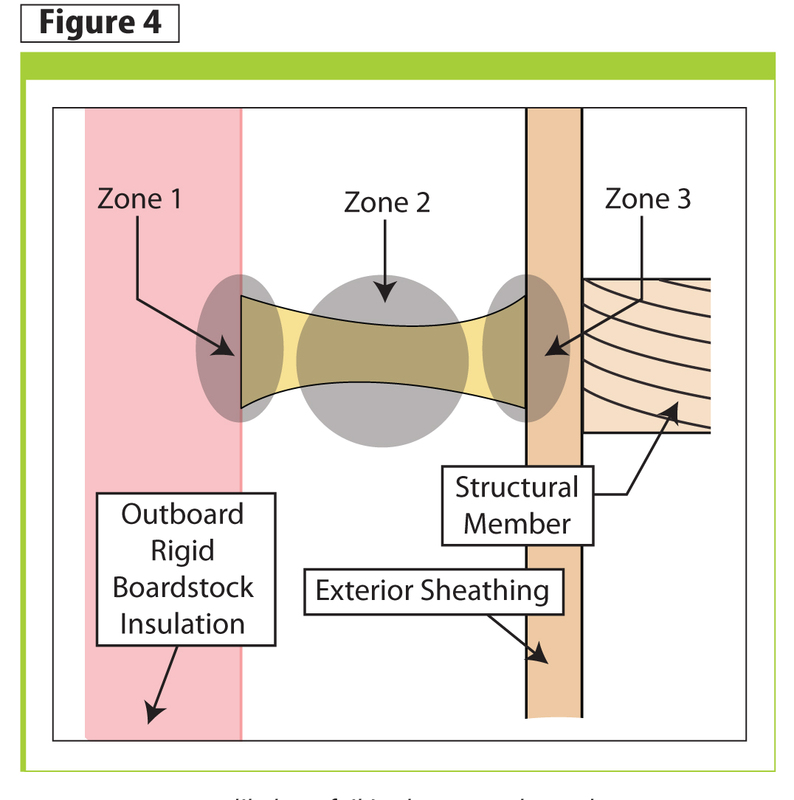 Smaller dimension sheeting and decking materials of the past—0.3 x 3- or 0.3 x 3.6-m (1 x 10- or 1 x 12-ft) shiplap boardstock—had more seams to help disperse both expansion-contraction stresses and air pressure equalization requirements (Figure 9). Today’s larger construction panels need assistive technology to help them achieve maximal performance. 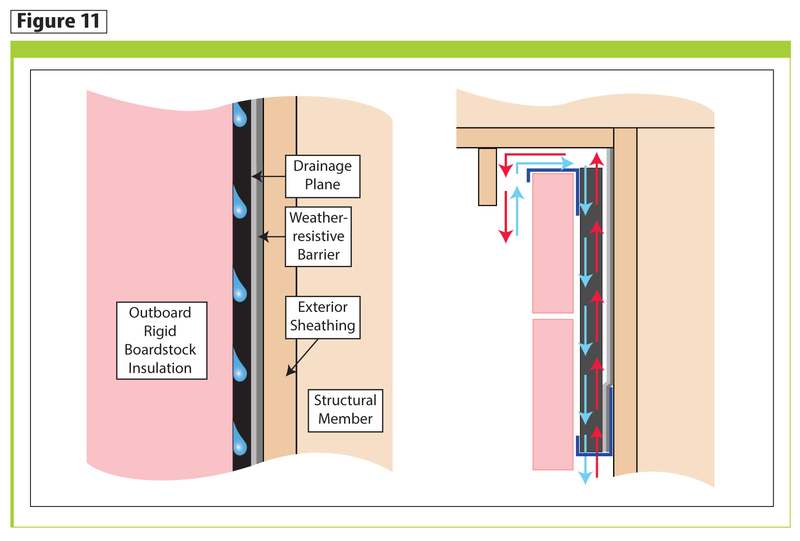 This technology comes from drainage planes and rainscreen drainage planes, technology that has a twofold benefit (Figure 10). First, the void (i.e. 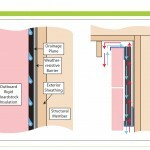 separation) this technology creates between the layers of the exterior building envelope (i.e. 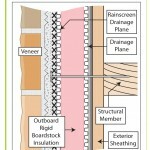 exterior sheathing, outbound rigid boardstock insulation, and exterior veneers) has, to a small degree, had a positive impact on expansion-contraction characteristics by allowing the movement to be smoother and more evenly dispersed because these manufactured rainscreen drainage planes act as slipsheets. 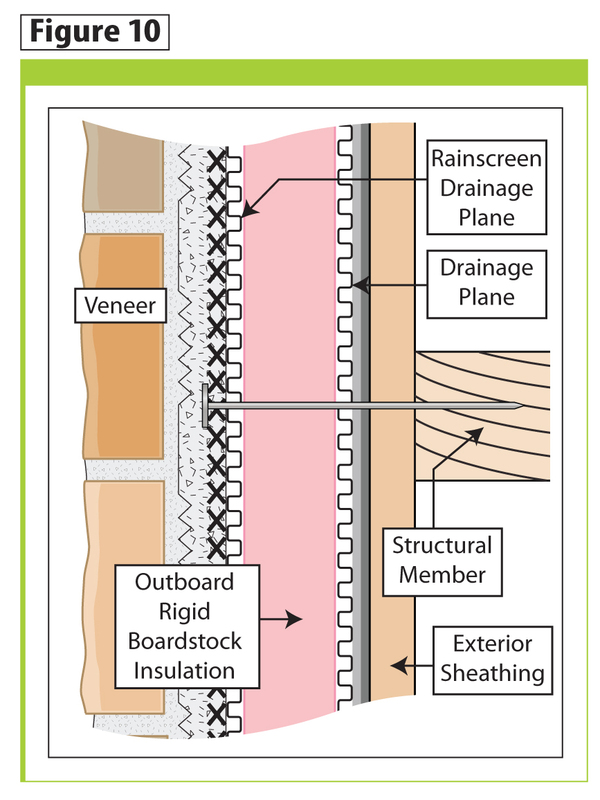 The more important impact is they are designed pathways for moisture that may attempt to accumulate between these layers of construction materials in the exterior building envelope to exit the system in a timely manner (Figure 11). 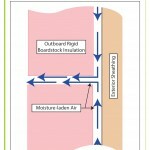 The design of the rainscreen drainage planes gives fluids (i.e. air and water) a more convenient pathway to follow past and away from the more vulnerable construction joints (Figure 11). No one can turn back those proverbial ‘hands of time.’ In the case of large-dimension material panels used in the exterior building envelope, it is neither possible nor necessary to return to smaller units. However, it is possible and necessary the construction industry understands whenever a new material with either a new dimension or composition is introduced into any system, it may have a negligible impact on the other materials used with it. The focus must be on ‘holistic’ building if achieving sustainable buildings is the goal. 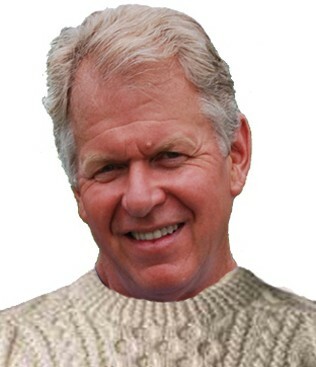 John Koester is the founder and CEO of Masonry Technology Inc. With construction experience dating back almost 40 years, he has been a card-carrying mason and cement-finisher; for many years, he operated his own masonry construction business in the Minneapolis-St. Paul area. Koester has extensive background in waterproofing systems in the areas of forensics, design, and installation oversight—both in restoration and complete re-roofing projects. 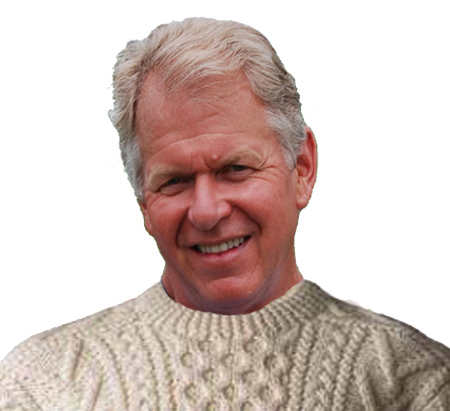 He can be contacted via e-mail at john@mtidry.com.